Fraction Sizes Explained: How to Pick the Right Size? The following charts will help you decide which size instrument is appropriate for your student. If you happen to choose the incorrect size, don't despair! We offer size exchanges at NO CHARGE, and in many cases we can arrange to bring the new size directly to your student's school. Please contact us to inquire about this service. To measure the arm length, have the child stand up straight with their left arm extending straight out to their left, palm open upwards. 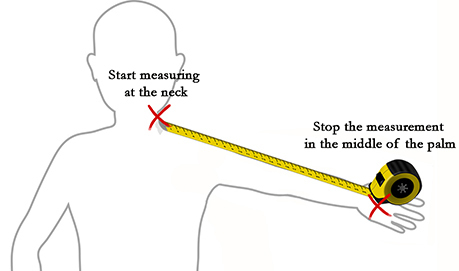 Start measuring at the neck and stop the measurement in the middle of the child's palm (see Figure on the left). Use the arm length (in inches) in combination with the child's age to find out the correct size of violin or viola that you need to rent from the Table 1 below. Table 1. Violin and Viola fractional sizes in relation to student's age and arm length. In order to determine the correct cello or double bass size for your child, please measure his or her height and use that as a starting point in combination with the child's age. Reference the Table 2 below in order to determine the correct size. It goes without saying, however, that the chart below can only give you an approximation of a height, age, and instrument size relationship as every child is unique! Finally, renting an instrument from us allows you to switch between fractional size instruments without an additional charge. Please contact us if you have any questions regarding this and the above table. Table 2. Cello and Double Bass sizes in relation to height and age.